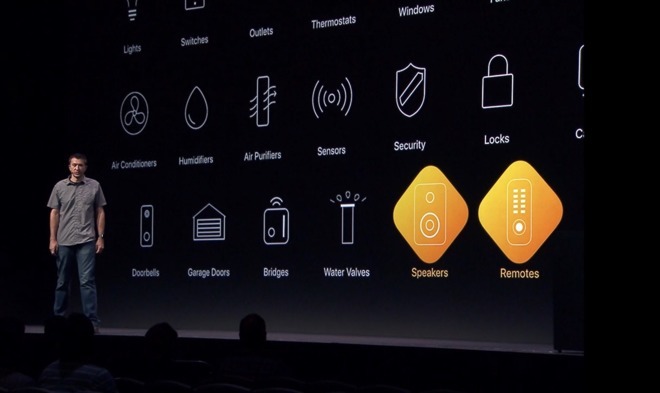 The new support was mentioned during Apple's "deep dive" session on HomeKit, specifically highlighting how manufacturer's remotes could interface with HomeKit and the Apple TV. Also mentioned was Siri support through a remote, but what that may mean for third party devices isn't clear at this point. Information is still scarce on exactly what can be done with remotes. At present, it isn't clear whether they can be any IR/RF device, or if it is limited to just interfacing with the Apple TV. Assuming any device could be added, this opens a lot of possibilities for smart home users. TVs, ceiling fans, and more would be capable of being added to the Home app. Using a third party remote with HomeKit support, scenes like "watch a movie" become even more useful. In conjunction with the IR features of the remote, HomeKit could dim the lights, close the blinds, switch the receiver input, turn up the receiver volume, and turn on the TV. Remote support has been a commonly requested feature, with many turning to the unofficial HomeBridge platform to add IR blasters and remotes into HomeKit accessories themselves. In other HomeKit news, macOS Mojave will soon add support, along with Siri and the Home app. HomeKit has been growing rapidly, with many new products announced earlier this year at CES 2018. Those products have just started hitting the market, including the First Alert Onelink Safe & Sound smart smoke/CO detector and speaker. iOS 11.4 also brought support for AirPlay 2 and HomeKit enabled speakers. AirPlay 2 was originally expected to launch with iOS 11, but was significantly delayed while Apple worked out the kinks. Now, HomePod and Apple TV can be controlled within the Home app, or through Siri. AirPlay 2 also supports multi-room playback, where audio from your iOS or tvOS device can be sent to many speakers simultaneously. Third-party speakers have already jumped on board the AirPlay 2 bandwagon, and many will be updated to support it in the near future such as the Libratone Zipp (review) and the Onelink Safe & Sound (review). Remote support will be coming this fall as part of iOS 12, tvOS 12, and macOS Mojave.